Water in Streamwood, IL - Angel Water, Inc.
Like many other Cook County towns, Streamwood gets its drinking water from Lake Michigan, and has been doing so since the 80s. The water is sourced from four offshore surface water intakes. Because the Illinois EPA considers surface water susceptible to pollutants, all surface water supplies in Illinois must be treated before consumption. This treatment is performed at two plants: the South Water Treatment Plant which serves the southern parts of Chicago and its suburbs, and the Jardine Water Treatment Plant which serves northern Chicago and its suburbs including Streamwood. From here the water is transported to and stored in tanks throughout the Village, which in this way aims to maximize its accessibility. 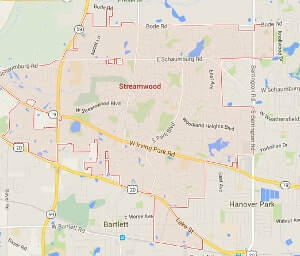 Streamwood also maintains an emergency backup water supply via ground water wells, which are exercised monthly. Despite treatment though, there is increasing concern about contaminants found in Lake Michigan. The impact is unclear as of yet unknown, but what do we know about the quality of Lake Michigan water? 18 Contaminants found within health guidelines and legal limits. The Village of Streamwood is located in Cook County, approximately 30 miles northwest of the Chicago Loop. For over a hundred years the area, known then as Hanover Township, was populated only sparsely by dairy famers—a 1950 census estimated 800 people. It was in the 50s that Streamwood got its real start. In 1956, Maxon Construction Company assembled 21 pre-made homes developed by L &amp; H Builders. The builders applied for incorporation as a municipality and on February 25, 1957 the Village of Streamwood came into being. L &amp; H marketed Streamwood in its brochures as “your Town of Tomorrow” and targeted WWII veterans looking for affordable suburbs where their families could settle using GI Bill loans. However, Maxon employees occupied the Village presidency and every position on the Village Board of Trustees, and failed to deliver the vision the brochures promised. Residents suffered unpaved roads, insufficient well systems, and lack of city services. Community members protested rate hikes for water and sewer services and drove trash to neighboring towns with cheaper waste disposal rates. In 1958, a group of “Marching Mothers” was arrested for protesting newly opened Woodland Heights School, where 400 children were forced to take classes in shifts in only 6 classrooms. Things improved when in 1962 Nick Kosan was elected Village President and control was wrested from the builders. Decades of growth followed. A fire department, city hall, park district, and library district were established, and the water company taken over. Residential, commercial, and industrial development took off. The 80s saw Streamwood’s reputation tarnished, as a former Village Manager underwent federal investigation, the Park District sued the Village over developer donations, and the Village engaged in territory disputes with neighboring Schaumburg and Bartlett. Services were still lacking. The 90s focused on rectifying these issues and restoring Streamwood. The Village resolved its boundary disputes, reinvested in infrastructure and services, and fostered continued development in all sectors. Today, Streamwood is one of the northwest suburbs’ fastest-growing communities. The future is bright for the Town of Tomorrow.